DO NOT USE THIS PAGE ANYMORE!! 'LIKE' us on FACEBOOK to keep up with our current events! Have you heard of AmazonSmile? Do you shop on amazon.com? AmazonSmile is a website operated by Amazon that lets customers enjoy the same wide selection of products, low prices, and convenient shopping features as on Amazon.com. The difference is that when customers shop on AmazonSmile (smile.amazon.com), the AmazonSmile Foundation will donate 0.5% of the price of eligible purchases to the charitable organizations selected by customers. 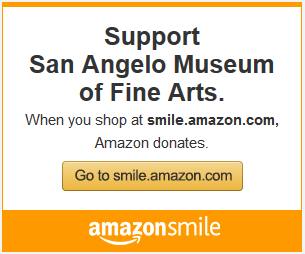 The San Angelo Museum of Fine Arts is now on smile.amazon.com. Please click the link below to select the museum as your charitable organization, then shop till your heart is content. Join the SAMFA Mailing List for occasional emails with details on upcoming exhibits and more. You can check the box for the Museum's E-blast or the Education E-blast or both. Be sure and check your email to confirm your subscription. You can also download our newsletter here.